Sophomoric? Members Of Congress Talk Like 10th-Graders, Analysis Shows : It's All Politics The sophistication of congressional speech-making is on the decline, according to the open government group the Sunlight Foundation. Since 2005, the average grade level at which members of Congress speak has fallen by almost a full grade. 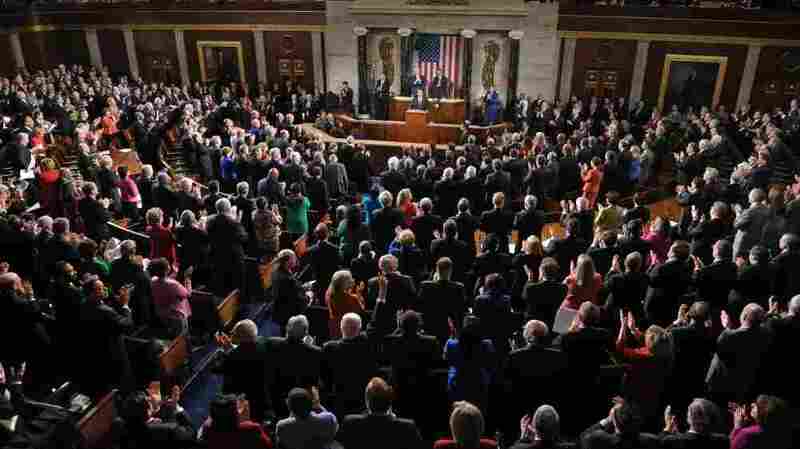 Congress, shown gathered for President Obama's State of the Union in January, is speaking at about a grade level lower now than in 2005, according to the Sunlight Foundation. 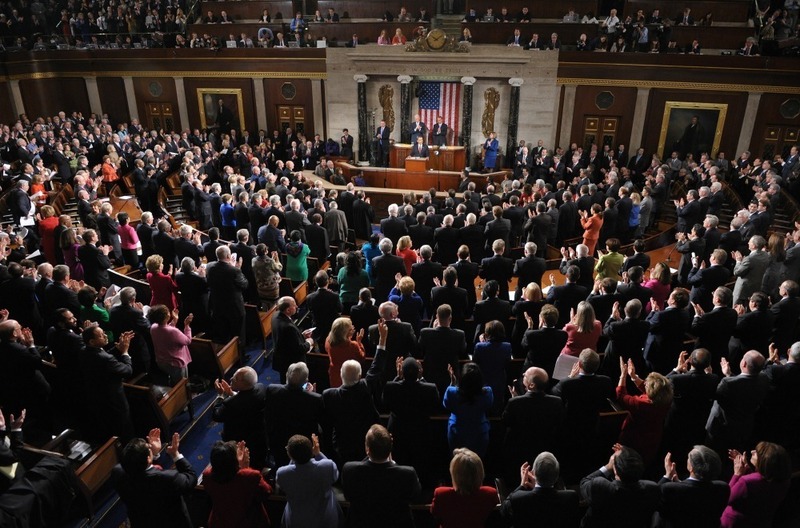 Members of Congress are often criticized for what they do — or rather, what they don't do. But what about what they say and, more specifically, how they say it? It turns out that the sophistication of congressional speech-making is on the decline, according to the open government group the Sunlight Foundation. Since 2005, the average grade level at which members of Congress speak has fallen by almost a full grade. The Sunlight Foundation analyzed the Congressional Record and found that Congress' ranking on the Flesch-Kincaid scale — which evaluates readability — has dropped a grade level in recent years. Flesch-Kincaid equates higher grade levels with longer sentences and words with more syllables. Lungren's grade level during this session of Congress: 20. Overall since 1996: 16. On the opposite end of the spectrum, Georgia Republican Rep. Rob Woodall registers the second-lowest grade level: 8.01. An example of Woodall's speech: "What do they say about socialism, Mr. Speaker? It's a great plan until you run out of other people's money. Guess what? We've run out of other people's money. I just want to show you a chart." That's five sentences, an average of about 7.5 words per sentence. "My mother will probably be embarrassed to hear this news," Woodall says, "but I'm glad to know I'm not obfuscating our challenges with words that are too complicated." Woodall is part of the large freshman class that came into Congress in 2010 — many of them backed by the Tea Party movement. Sunlight's Drutman says this infusion of new members looks to be part of the reason for the overall grade-level decline. "Particularly among the newest members of Congress, as you move out from the center and toward either end of the political spectrum, the grade level goes down, and that pattern is particularly pronounced on the right," he says. Of the 10 members speaking at the lowest grade level, all but two are freshmen, and every one is a Republican. For the record, though, Drutman isn't passing judgment about whether speaking at a lower grade level is a good thing or a bad thing. South Carolina Republican Rep. Mick Mulvaney ranks the very lowest, with a grade level of 7.94. "Gosh, I guess I should be disappointed that I'm not using my higher education to better use, but, oh well," Mulvaney says. "I hope people don't take it as a substitute for lack of intellect, but small words can be just as powerful as big words sometimes." Mulvaney graduated with honors from Georgetown and earned a law degree at the University of North Carolina, Chapel Hill. His father was a high school grammar teacher. "I was trained to write in a clear and concise fashion, and you didn't use big words if small words would do," he says. "Certainly I'm not trying to dumb down the message by any stretch of the imagination." Frank Luntz, a Republican consultant and language guru, puts it this way: "It's not an issue of dumbing it down; it's an issue of cleaning it up." He says there was a time when members seemed to use the biggest, most complicated phrases possible and didn't really worry about whether the public could understand them. Now, he says, members are no longer just talking to each other. They're talking to the public through cable TV and YouTube. "Life has changed," Luntz says. "They not only expect but they demand that members of Congress communicate in a way that is more understandable and more meaningful to them." The average reading level of Americans is between eighth and ninth grade. Oh, and in case you were wondering, this story was written at an 8.2 grade level. A look at the members of Congress whose words in the Congressional Record rank highest and lowest by grade level, according to the Sunlight Foundation. A previous version of the Ranking Members chart incorrectly indicated that Louisiana Rep. Rodney Alexander was a freshman. Alexander has been in office since 2003.